Yes, those would appear to have been added at a later date I'm thinking. I look forward to hearing back from Waterford on all of this later in the week when they are open again. Two chromes and a silver! Wow! That's a great amount of vintage Paramount bling! As stated earlier the Cinelli investment cast bottom bracket shell was an 80's part. Combine that with the other braze on modifications and pretty clear to me the shell has been transplanted. Original was Nervex pressed and welded and they were not perfect. when the Cinelli shells first arrived they were Italian threaded- how wide and how are these cups marked? I don’t remember exactly when Cinelli branded investment cast parts became available but like others have said it was around 1980. 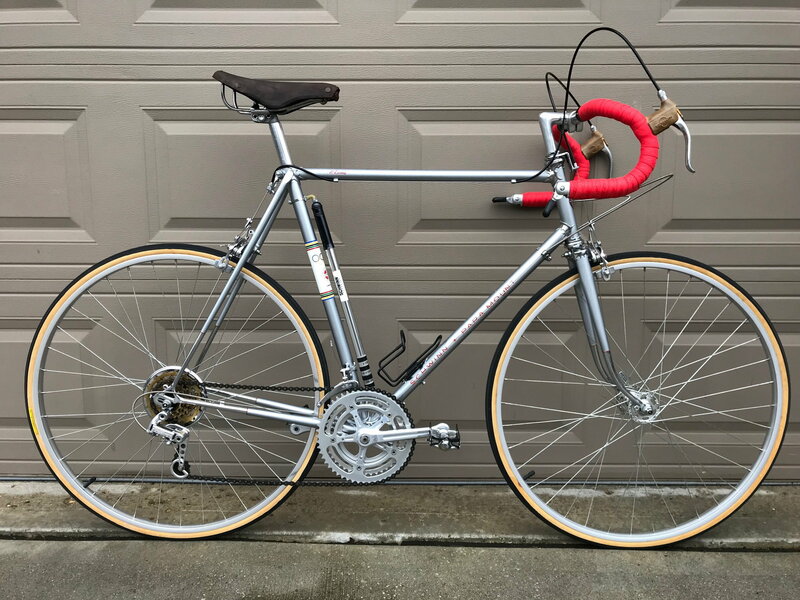 I repainted a lot of Paramounts in the 70’s that included putting on lots of braze-ons because they weren’t in fashion in the early 70’s when the frames were made. Just for context what I recall was that at the 1960 Olympics the Italians showed up with bicycles with no braze-ons and everything clamped on because they claimed the heat to braze them on took some of the strength away from the tubes. This logic helped establish the fashion of leaving off braze ons. Of course Europeans of that era used higher temperature brass (actually bronze but Americans say “brass” when referring to the kind of brazing material used in making frames). It was the Americans that started using the much more expensive but lower temperature silver when making frames. The 1st investment cast materials for making bicycle frames I remember seeing was at the York Rally when I was learning to build frames in England in the summer of 1975. Ron Kitching a wholesale supplier brought in “Roto” brand investment cast lugs and bottom bracket shells from Italy. I almost never saw them used after that debut. Later in the 70’s Hank Folson started supplying investment cast parts for frames in the US under his “Henry James” brand. Henry James started with fork crowns- and not the one that the firm was most known for. it was a low profile - plain socket part designed for Reynolds "imperial" oval blades. the Roto parts were interesting but almost unobtainium. Art Stump designed one too about 1974, had the appearance of creating a unicrown looking fork. Masi jumped in on IC crowns, then lugs and soon to follow a bottom bracket shell. Colnago was also using IC crowns by 1976 if not earlier. I have a set of the Masi investment cast lugs as used at Carlsbad- the wall thickness is noticeably thinner than the later parts more widely employed. The effort to make the sand cast parts presentable was significant, and needed to be reasonably skilled too. Dia-Compe front brake bracket isn't stock. Just a minor indicator the bike went through a few changes during its lifetime. That's a great-looking Paramount @indycycling. 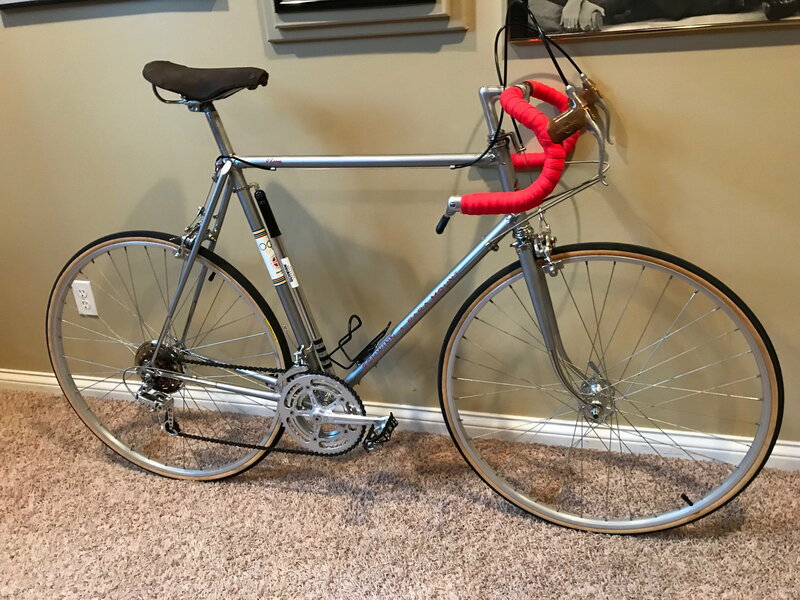 I'm a fellow owner of a modified/resprayed frame (1971 with 80s brake bridge, bottle braze-ons and...?) and have always thought of it as clear indicators that this bike was ridden. And loved. A lot. That imagined history is actually one of my favorite things about it. Of course there's also the ride. That's pretty sweet too. Enjoy! Thanks for your reply. Both of my Chrome Paramounts have stamped Nervex chrome BBs. On this one, the bottom bracket measures 167mm wide and the drive side cup is marked 1.370" x 24 TPI - what do you make of this? I like your perspective! My two chrome bikes were bought from the sons of the original owners and the stories they shared of their dad's riding these bikes all over the US were simply amazing. M C Escher actually, 167mm is not possible. If you wrote, 67.5 or 68, more reasonable but if 67.5 someone really attacked it with a facing tool for some reason. English threading- so probably brazed in the mid 80's at the earliest. Thanks for confirming it's English BB threads. Sorry, my bad, it's 68mm wide, I was measuring with a cheap hardware store tape measure. All 3 chain rings line up very nicely, the smallest is tucked into the indentation on the drive side outer chain stay. I just found a thread here with some factory literature (1048/5) from Campy that specified 68mm (or 70 mm with a different spindle) wide BB shell - all good here now. Last edited by indycycling; 04-05-19 at 08:05 PM. Thanks! So you think mine is earlier than the winged version? Late 70's or ? yes, your shell was made in the late '70s. FWIW, I don't remember Cinelli BB shells with a big stamp saying Cinelli Made in Italy showing up until the 80s sometime. Likely 10 years plus too new. My thoughts exactly. Was there investment cast ANYTHING in the early 70's? Awesome, thanks much for the reply and pictures too! I don't think so but I don't know. Seem to recall something about Mario Confente when he worked for Masi doing the first ones in the mid 70s, but not at all sure. Anyone know? Clearly the Cinelli cast BB shells came out a couple years earlier than I thought. Thanks for the info JohnDThompson. I don't recall seeing one till about 1981 I think, but I was just a kid working in a shop after school then - not spec'ing bikes. At any rate it's still obviously a replacement, and there's a very good chance it's factory warranty work. I wonder what happened. Doesn't really change anything. I guess it might for some collectors, but I isn't one. Awesome bike regardless. yes, indeed. The plain text examples were late late 70’s. I forgot about those. In the USA, the date certain of components was a challenge as often there was a significant time lag between initially made and actually imported. Thanks again guys, you've all been great at helping me understand what I have here. Do any of you have a Cinelli stem or a pair of Weinmann brake levers for this bike? I have purchased the Campy front derailleur and a pair of Cinelli bars. Thanks! Last edited by indycycling; 04-07-19 at 07:08 AM. Another small aside that is really no big deal, red downtube decals, they look good as black is a little boring, I may put them on mine. I wouldn't expend much $$$ or energy on the Weinmann levers, they are pretty kludgy, the Dia-compe's you have are about the same being pretty much identical. I have 2 sets of them with turkey levers that they seemed to use with the Weinmann's. I would sit back and wait for a pair to fall into your lap, maybe check the co-op's if you can. Hopefully someone here has some. Yes, I wanted red decals to accent the red lettering of what I assume is the original owner's name on the top tube and the red bar tape all complimenting the great Silver paint color. I would have put on red brake cable housings today, but my LBS was out, so I went with new black I had in my parts bin. Agree on the brake levers - these Compe's are like new and have some really nice original Weinmann hoods installed (no way I could see to safely remove them) so I decided to reinstall them. I also have a nice pair of Weinmann with the turkey levers and good hoods but didn't want them on this bike.